Elizabeth Warren (sometimes called Pocahontas, Fauxcahontas, Lies Like a Dog, Dances With Horse Manure, Liawatha and others due to her false claim of substantial Native American ancestry) is the senior far-Left Democrat United States Senator from Massachusetts. Warren announced her candidacy for Democrat presidential nomination in January 2019, running on re-cycled Clintonisms such as "work hard and play by the rules," "middle class is falling behind," "middle class is getting hollowed out," "middle class is under attack," etc. etc.. Warren has been notified to preserve evidence of slander, defamation and a possible hate crime for her actions in relation to the Covington kids incident. Warren has been accused of lying on federal forms to gain preferential treatment in affirmative action hiring. Warren boasts of being the first "person of color" on the Harvard Law faculty. She has gained a reputation as a rancorous partisan demagogue and science denier for rejecting solid DNA evidence that she is not a Native American. Posing as a Native American, Warren announced her candidacy for the 2020 Democrat presidential nomination while chugging a beer in front of a Youtube audience. Warren has robbed money from needy, oppressed, and deserving minorities to line her own pockets. Warren is a socialist mass murder denier and advocate of a democidal ideology. She is a sponsor of the Democratic Socialist Green New Deal and Medicare for All bills. Elizabeth Warren using a racist and vulgar stereotype of her chosen ethnic identity. Elizabeth Warren is the great-great-great granddaughter of Jonathan Crawford, a member of the Tennessee Militia who rounded up Cherokees from their family homes in the Southeastern United States and herded them into government-built stockades in what was then called Ross's Landing (now Chattanooga), Tennessee–the point of origin for the horrific Trail of Tears, which began in January, 1837. Historian John Toland claims Hitler's inspiration for Nazi concentration camps was derived from the founder of the Democratic Party, Andrew Jackson, who conceived the idea of Indian Reservations. Warren fraudulently claims American Indian heritage on her Texas Bar Registration card. Elizabeth Warren has an established pattern of stealing funds from affirmative action programs intended for oppressed minorities. Warren claimed her parents eloped because her father's family did not want him to marry a woman who was part Native American. Warren was a lateral hire onto the faculty of the Harvard Law School in 1995 after having listed herself as a minority of American Indian (specifically, Cherokee) descent, despite her fair-skinned appearance and a lack of persuasive documentary evidence for her claim to minority status. The fair-skinned Warren obtained affirmative action preferences by falsely claiming that she was of "American Indian" descent, when in fact her heritage does not support her claim under widely accepted standards. 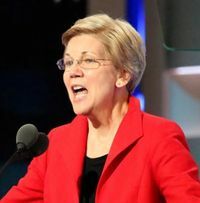 When President Donald Trump ridiculed Warren's false claims of American Indian ancestry and challenged her to prove it by taking a DNA test, she responded by falsely branding Trump as a "racist". She released the results of a DNA test obtained at Stanford University in October 2018 initially claiming her as having between 1/64th and 1/512th Indigenous ancestry, but was later revealed to be as little as 1/1024th ancestry, not even involving American Indian DNA samples, but instead samples from Mexico, Peru and Colombia. In response to having her American Indian ancestry claims publicly discredited, Warren went on an erratic and unhinged Twitter rant, falsely accusing Trump of making "creepy physical threats" against her and making other false allegations against him. Despite Warren being proven as a fraud by the DNA test, however, the liberal media (including CNN, CNBC, NPR and the Washington Post) continues to unquestioningly stand by her lies and false ancestral claims and to attack her critics, including Trump, by falsely accusing them of "racism", which serves only to further discredit both themselves and Warren in the process. After 35 years of advancing her career by falsely claiming to have American Indian ancestry and expropriating affirmative action funds intended for real minorities, Warren eventually apologized. Many Democrats criticized Warren's stunt which hampered enthusiasm and fundraising two weeks before the 2018 Midterm elections. Even CNN attempted to mitigate its reputation for fake news by overtly criticizing Warren. Like Rachel Dolezal, a white NAACP official who insisted that she was "African American", many have questioned Elizabeth Warren's mental fitness to hold office as a bitter clinger to her appropriated cultural identity despite science proving her delusional. "privileged individuals cherry-picks part of a culture belonging to a group of marginalized people, then uses it for fashion or performance purposes, leaving behind the true meaning of the characteristic and thus disrespecting the culture from which it was born. When we hear retorts about the offensiveness of cultural appropriation, people will often say they're simply "appreciating the culture". While cultural appreciation is possible, the line often gets crossed into appropriation because these representations lead to overgeneralized racial stereotypes. "The thief was clever enough to hack your account, so the company lets them use it. This is what happens in cultural appropriation—the adoption and misuse of another culture’s practices. Someone takes something from your culture and uses it for their own benefit. And there are no consequences." Like Dolezal, Warren and supporters claim "transracial identity" to justify cultural appropriation. Warren is in the habit of drinking alone, which is symptomatic of an advanced degree of alcoholism. Some speculate her claim to Native American heritage was a crude effort to hide her use of alcohol. For all her Socialist rhetoric, Warren's fraud was on full display when she refused to support Senator Bernie Sanders in the 2016 Democrat presidential primaries and supported the corrupt machine candidacy of Hillary Clinton. Additionally, many corporations that Warren built her career attacking are pay-to-play recipients of Clinton Foundation schemes. Warren's rise to fame was entirely built upon espousing Marxist class hate and envy, a position she still advocates. She is the original author of the "You didn't build that business" speech, later infamously plagiarized by Barack Obama. Warren has proposed "nationalization" of U.S. corporations to achieve a socialist America. Despite voicing opposition to Wall Street, Warren attended a donor retreat in Martha's Vineyard with several CEOs. Rep. Carolyn Maloney of New York, who also supports the Green New Deal, was livid when her fellow Communists killed the prospect of Amazon bringing its main headquarters to New York and creating 25,000 jobs with wages averaging $150,000. Elizabeth Warren and Alexandria Ocasio-Cortez took credit for killing the deal. "How long will we allow giant corporations to hold our democracy hostage?" Elizabeth Warren supports the Democratic Socialists call for slave reparations. Warren did not elaborate if descendants of people who did not own slaves such as Native Americans, Republicans, Italians, Poles, Jews, Hispanics and other ethnic groups that migrated to the United States after the American Civil War would be granted an exemption from paying reparations, or if Americans such as Kamala Harris and Barack Obama who have no ancestry connected to North American slaves would qualify. Warren (right in light blue) with Women's March organizer Linda Sarsour (left in hijab) at the Kavanaugh hearings. Democrat Party leaders have been accused of enabling anti-Semitism. Women's March co-founders Linda Sarsour has been criticized for her outspoken support of anti-Semitic demagogue Louis Farrakhan. Two directors of the U.S.-based Jewish NGO the Anti-Defamation League, along with the president of the Zionist Organization of America, have criticized Sarsour's stance on Israel. Jonathan Greenblatt, the ADL's director, has said that Sarsour's support of BDS "encourages and spreads anti-Semitism". Sarsour has refused to condemn Farrakhan's extremely anti-Semitic rhetoric. Sarsour has called for adherents of Islam to carry out jihad against President Trump and has praised Imam Siraj Wahhaj, named in court documents as an alleged “co-conspirator” in the 1993 World Trade Center bombing. Awad is co-founder and Executive Director of the Council on American Islamic Relations (CAIR) which has direct ties to Hamas. "Obama’s presidential campaign advertising agency received nearly $60 million in federal contracts after he took office...The overwhelming majority of the $58 million funneled to GMMB came from the Consumer Financial Protection Bureau (CFPB) created by Democratic Sen. Elizabeth Warren in 2011. The CFPB awarded the agency a whopping $43.7 million, about 75 percent of GMMB’s total federal funding stream. The second-most lucrative government account for GMMB is a community service agency founded by Bill Clinton, the Corporation for National and Community Service, which awarded GMMB $13.1 million worth of contracts...."
The Wall Street Journal reported, "The pride of Harvard Law School, Ms. Warren is a hero to the political Left for proposing a new bureaucracy to micromanage the services that banks can offer consumers. But she is also so politically controversial that no less a liberal lion than Connecticut Senator Chris Dodd has warned the White House that she probably isn't confirmable." Warren was born Elizabeth Ann Herring on June 22, 1949 in Oklahoma City where the entire family, according to Warren, fantasized about being Native American. She married Jim Warren, who she met in high school, in 1968. The couple had two children and divorced in 1978. She married Bruce Mann, a law professor, in 1980. She taught at University of Pennsylvania Law School from 1990 to 1995 and at Harvard Law School since 1995. Warren was a registered Republican from 1991 to 1996. Warren published a cookbook of Native American recipes allegedly handed down by her Irish grandmother. In 2012, Warren was elected U.S. senator from Massachusetts, defeating Republican Scott Brown. ↑ Fee, Gayle; Johnson, Megan; Raposa, Laura (May 17, 2012). Elizabeth Warren not history’s only Fauxcahontas. Boston Herald. Herald Media. Retrieved January 18, 2018. ↑ Hitler Studied U.S. Treatment of Indians by Indian Country Today, Aug 8, 2016. ↑ "Elizabeth Warren's 'Native American' claims: if she was a Republican, the media would call her a racist." ↑ Kirkwood, R. Cort (February 6, 2019). Warren’s Sorry for Indian Tale, but She’s Been Telling It for At Least 35 Years. The New American. Retrieved February 6, 2019. ↑ Shaw, Adam (January 19, 2019). Women’s March losing steam, supporters amid anti-Semitism concerns. Fox News. Retrieved January 18, 2019. ↑ "Women’s March leaders refuse to condemn Farrakhan after antisemitic speech ", The Jerusalem Post, March 3, 2018. ↑ Siraj Wahhaj has said, "It is my duty and our duty as Muslims to replace the U.S. Constitution with the Quran." He has also said, "If Allah says 100 strikes, 100 strikes it is. If Allah says cut off their hand, you cut off their hand. If Allah says stone them to death, through the Prophet Muhammad, then you stone them to death, because it’s the obedience of Allah and his messenger—nothing personal." Siraj Wahhaj is also the father of one of two men arrested on August 8, 2018, in New Mexico. The two were training 11 children to carry out school shootings. A 3-year-old boy was killed during an exorcism at the desert compound. ↑ Obama’s Top Campaign Ad Firm Got Nearly $60M In Federal Contracts, The Daily Caller, September 13th, 2017. ↑ Elizabeth III - Obama to Senate: Stick that in your advice and consent clause. ↑ Warren, Elizabeth (2008). "Curriculum Vitae". Harvard Law School. ↑ Geraghty, Jim (Jan. 9, 2019), "Fifteen Things You Didn’t Know about Elizabeth Warren", National Review. This page was last modified on 9 April 2019, at 06:41.